Get better at promoting health and wellness with ePromos' promotional health and safety products! Help clients, potential clients and employees of all ages feel better both physically and mentally with any of our useful and versatile healthcare memorabilia. When you brand your logo onto any of our promotional healthcare products -- pillboxes, fitbits, first aid kits, ice packs, safety equipment and more -- you'll be well-equipped to market your hospital, private clinic or other healthcare facility. They're even great for starting an internal health program for your employees. So browse our inventory now to start nursing your promotional efforts back to health! You'll feel safer while performing outdoor activities with these armband safety custom lights that offer two different settings to make the wearer noticeable in the dark. This combination TSA Approved Custom Travel Lock will help keep items secure during travel. Since it is TSA approved, it can be opened by airport security if needed. Be seen when you are out running, walking, biking, playing, etc after dark by wearing these shoe clip safety custom lights. Going on an outdoor trip is easier with this 35L Water Resistant Custom Backpack Dry Bag that is convertible to a carry bag for ease of use. It features a roll top closure and front pocket for extra storage. Its adjustable shoulder strap makes it comfortable for carrying. 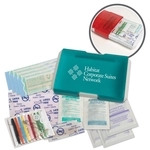 Promotional aid kit with first aid and sewing set for on-the-go emergencies. Brand promotional health & safety products by printing your logo on them today! ePromos carries a variety of products for healthcare giveaways and promotions so no matter what field you're in, you can promote your message or brand with surgical precision. There are dozens of medical trade shows and expos that show off the latest technology and innovations within the medical field. The next time you exhibit or attend, have some fun with it and bring some custom branded wellness promotional items for the attendees. We have anything you could possibly want. Encourage people to get more exercise with a customized pedometer. We have a variety of customization options from quality brands like fitbit. Help the seniors you work with by holding health promotion giveaways and give out pillboxes to help them organize their medications. Or, hold safety promotional items giveaways and entice athletes and parents everywhere with logo ice packs and first aid kits to treat those bumps and bruises. We have hundreds of useful and memorable wellness promotional items and safety items just itching to have your logo imprinted onto them. It might be a bitter pill to swallow, but it's time you started a new health and wellness promotional campaign. ePromos is here to help you ensure your marketing efforts remain alive and well, so give our brand specialists a call to get started with promotional health products.